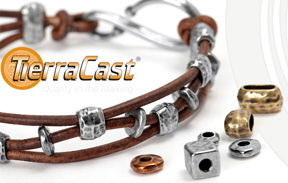 Make your own leather jewelry with our new leather cord and TierraCast components. These make great "manly" jewelry and are very popular with the younger customer. Visit our full line of leather cord and our line of 2mm hole Murano Glass Beads to use on the leather.